In many countries around the world, a huge proportion of young people still live at home with their parents. According to an OECD report, that trend is most pronounced in countries badly hit by the global financial crisis, particularly in Italy, Greece and Spain. 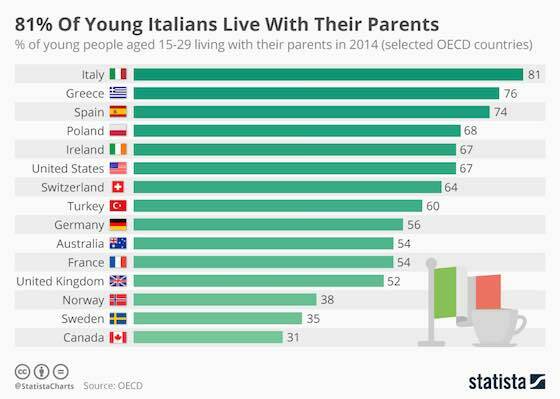 8 out of every 10 Italians aged between 15 and 29 still lived at home with their parents. In Scandinavia, youth living at home is a rarer phenomenon. In 2014, only 35 percent of young Swedish people still lived with their parents. The chart above shows the percentage of young people aged 15-29 living with their parents in 2014. Europe: "Young Europeans Living with Parents"